Hi Greg! Thanks for stopping by. 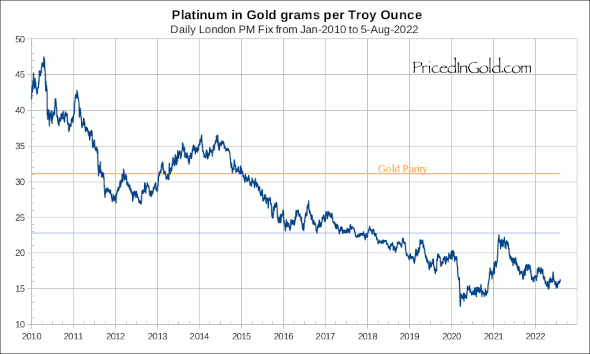 This chart shows the number of grams of gold required to buy one troy ounce of platinum, based on the European price of platinum (from http://www.platinum.matthey.com) and the price of gold, based on the London PM gold fix from http://www.lbma.org.uk. Hi again Charles, have you considered pricing Palladium in gold? Many thanks! I have considered palladium, but haven't found a convenient source of data. The site lppm.com has data, but only in one year chunks – a bit more work to organize than I have time for at the moment. If you find a good source of palladium fixings, let me know, and I'll put together a chart. hmm.. just a little poking around and I see what you mean. Best I could find is: http://www.chartsrus.com/ but not sure if you can access the data. They show palladium prices from '71 thru '05 (though the chart titles imply that they are only through 2002), and a gold/palladium ratio chart is also provided. I'm not sure why there's no recent data, but perhaps your other sources could fill that in. Even if so, it's still likely to require more work than for your other charts. In any case, thanks for trying. Hi. 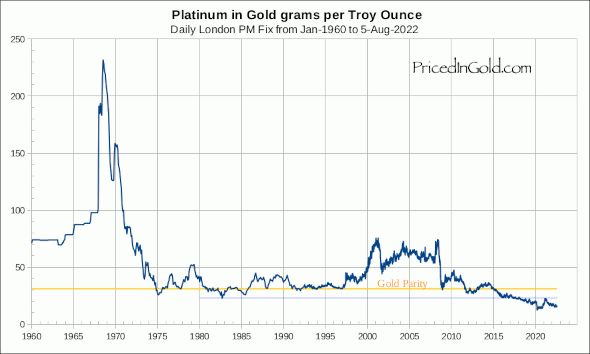 The Perth Mint published palladium data back to 1995. Thanks, Steve! That looks like an excellent resource!